When we were about to spend our first Christmas here in Charleston, SC, I knew I needed to retool the way I had approached my Christmas decorating in New England. Everything was different-red, green and gold, steeped in tradition and cute all over. This just wasn’t going to work for me and my new home. Our Christmas in Charleston called for fresh, new and exciting and I was ready for it! Christmas decorating comes with its own set of challenges, especially for a professional designer. The pressure is really on to have the most put together, perfect tree with all the perfectly coordinating holiday decor. There just one problem: I’m not perfect. I’ve learned through years of trying, one cannot achieve perfection. Besides, it’s probably boring. Take on a new approach to decorating this year: Think of what you did last year, the year before (yawn), and the year before that, and forget it. I know it’s against some unwritten rule for Interior Designers, but in the case of my Christmas Tree – pre-lit faux – it’s the way to go! It’s more conducive to my decorating style, and besides, faux trees start out perfect! 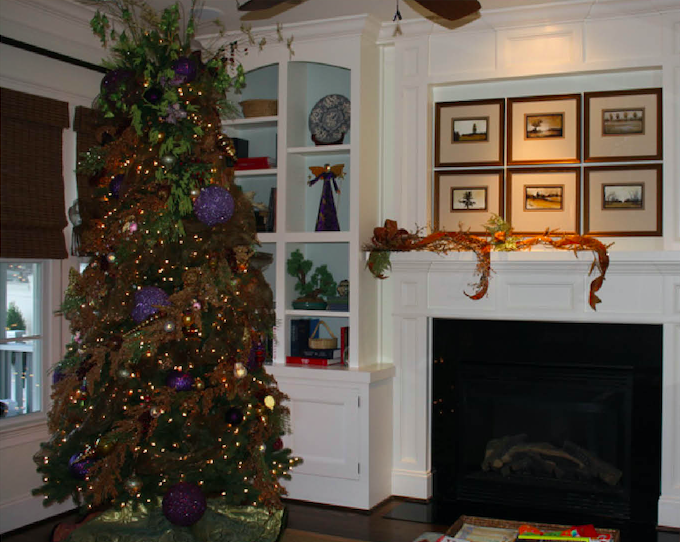 Less is more is my mantra for interior design – edit, then edit some more – but when I decorate a tree, more is more. The key is control and knowing when to stop. We have a 9’ tree with 1,200 white lights. The problem with some of the pre-lit trees is that the lights are all on the tips, leaving the center of the tree dark. I have supplemented with additional lights placed towards the trunk of the tree. This makes everything glow from within! Try a color for added dimension. Be practical: Asses the space – traffic patterns and safety. Make sure the lights work before stringing the tree! Take a moment, stand back and look at it from all angles to be sure it’s straight. Secure it tightly in the stand. 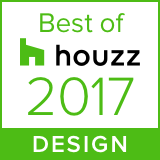 Color – Traditional red and green can be challenging in any decor. It could be time to try something new. Get inspiration by walking out your door. I love the tonal colors we have all around us in the marshes and magnolia leaves – browns and green. Throw a bright color in there for the element of surprise – purple, chartreuse, fuchsia. Don’t forget to sparkle. Themes: This is a great idea for continuity through your home’s holiday decor – nautical, beach, pets or old fashioned Santas can be fun and reflect your interests and personality. The use of color or natural elements can be used as a theme for a sophisticated look. These are great things to keep in mind while you shop or while you’re hunting outside. The first step is to string the lights. Address the whole tree, not just the branch tips. Wire from the inside out. Second is to put on the tree topper. If you don’t need to follow tradition, do this first. Saving it for last risks disturbing what you just spent hours doing or breaking branches. Your topper can be anything the crowns your tree in glory. Rethink that one star at the top. Think about a bunch of stars of different sizes and colors, use floral tape to hold them together and stick them in the top, securing with floral wire. Not one angel, but image a flock of them hovering around the top. I have taken these pointy toppers, you know the ones that you’re suppose to stick the highest branch into the bottom of? I’ve grouped them together at the top so they point in all directions. It’s effective. The point is, it doesn’t need to be an angel or a star. You are only limited by your imagination! Next, add the garland. 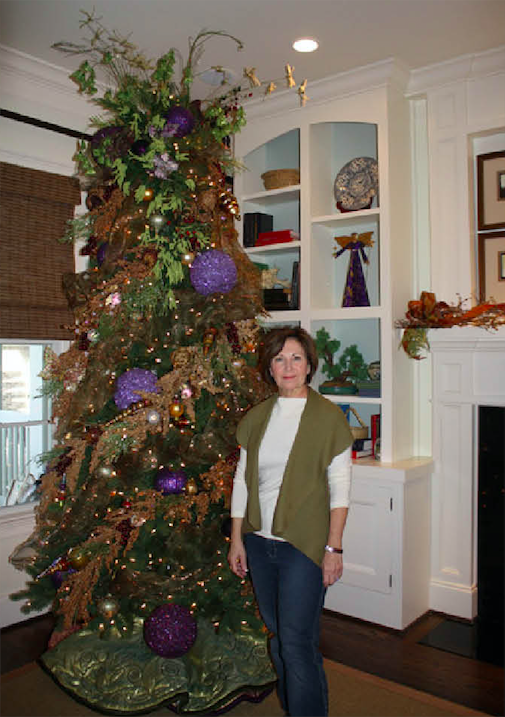 Materials like natural rope on a faux tree or an artificial one on a natural tree add an unexpected element and add volume to an otherwise sparse tree. If you want to stay traditional,, use popcorn or cranberries… If you want to pump up the volume, try embellished gold branches, glitter burlap, or extra-wide wired ribbon. Starting at the top, weave your garland in and out of the tree in an elongated spiral. Composition: Hang the largest ornaments first, setting up a visual rhythm that keeps the eye moving; left to right, up and down. Work down in size from there, placing the most beautiful or sentimental ornaments front and center. Important: To prevent your tree from take a face plant, distribute the weight all around the tree. Layer with textures: Textural depth and interesting shapes add an unconventional twist. Spray paint palm fronds and ferns that you collected outside. These are the elements that can break the triangle’s shape if placed strategically in the tree. They can also be functional, plugged into bare spots or placed to hide extension cords. Remember to add the sparkle. Play with scale and proportion by thinking outside the box. 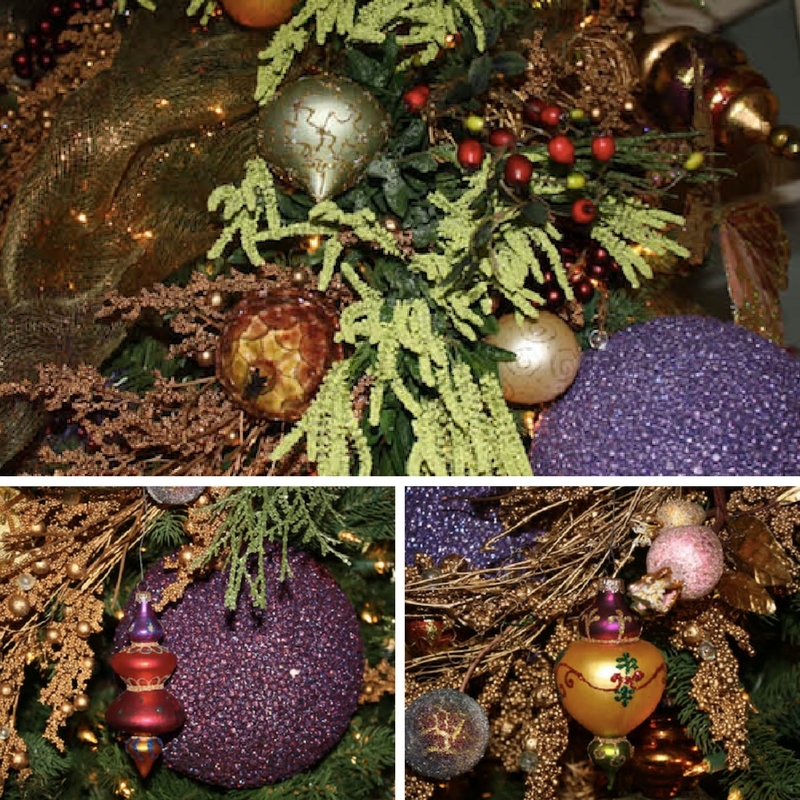 Re-use: Give a new look to your existing ornaments by bunching three ornaments together for a dazzling impact. Re-purpose: Head outdoors to the garden to hunt for potential fillers for the tree. Re-cycle: Consider a living tree for replanting. However, the life of a faux tree can be 5-7 years. Re-think: This year, try coloring outside the lines and watch the magic happen. Have fun and add the sparkle!